Zambia, formerly Northern Rhodesia, became an independent republic within the Commonwealth in 1964. Coton House, at 347 Independence Avenue and with 1½ acres, was leased in that year as a temporary residence, and bought for £14,000 in 1966 as the probable future home for the deputy high commissioner once a new residence had been built. 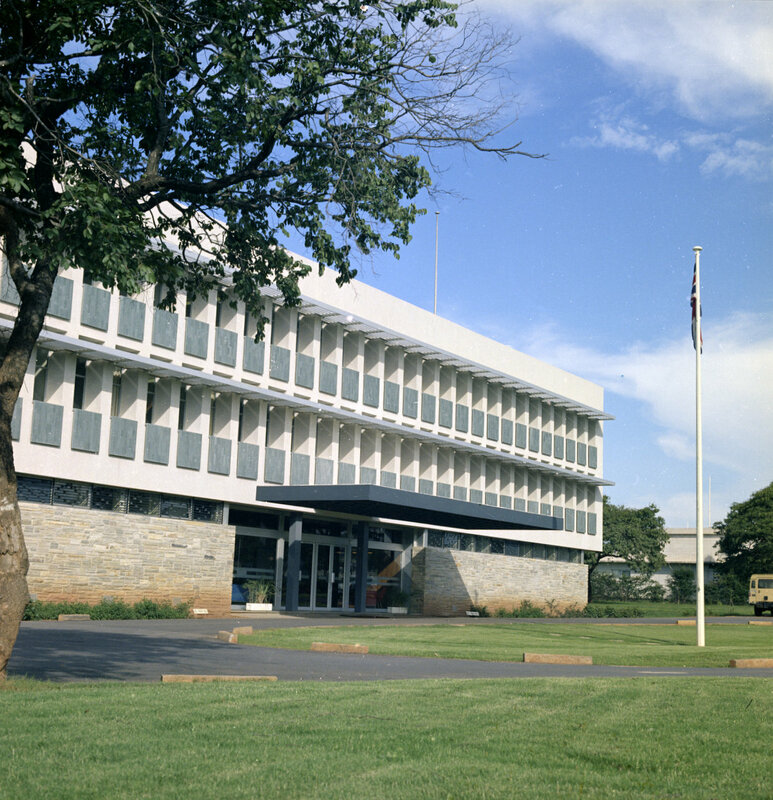 To that eventual end, a 99-year lease on Stand No.7526 on Robert Kennedy Avenue was acquired in 1973 but it was sequestrated by the Zambian government in 1976: the British government’s claim for compensation of £66,000 remained unmet ten years later. Coton House was therefore extended in 1979 with a study and private sitting room, and remains the residence. About fifteen staff houses were acquired on various terms around the time of independence (in 1975, all Lusaka freeholds were translated into 100-year leaseholds). An unsatisfactory two-storey flats block called Burton Court was also acquired in 1966. This was replaced in 1992 by a development of eleven houses and amenity facilities on a 1.2 hectares site that was already owned on Leopards Hill Road, and enlarged by the purchase of an adjoining plot. The architect was Francess Easmon of the Foreign Office. Burton Court was then sold. [Temporary?] offices were leased in 1964 when the landlord of a site at Stand No. 5000 Waddington Road erected [?] a block of offices at a cost of £40k. 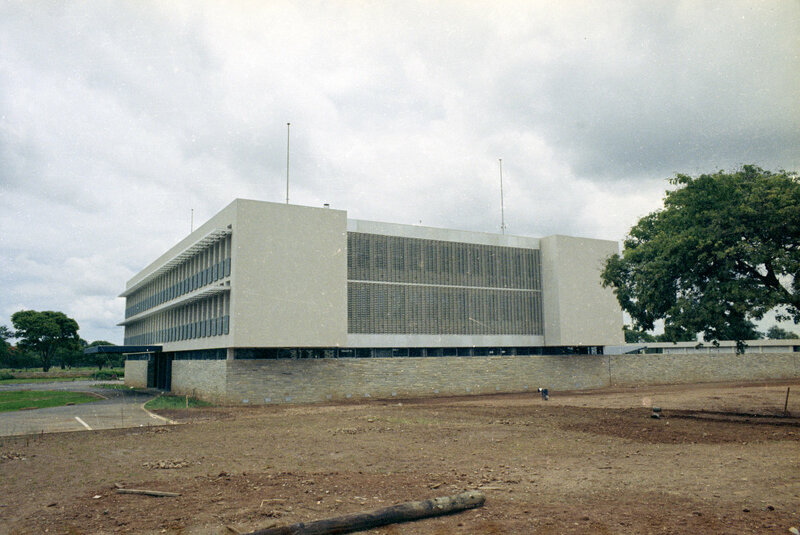 Design work on a more permanent building started in 1967 in the Ministry of Public Building and Works (under senior architect Peter Wheeler, with Alan Wild as job architect). A 3 acre site was acquired in March 1968 for £7,162 at Stand No.5201, Independence Avenue. 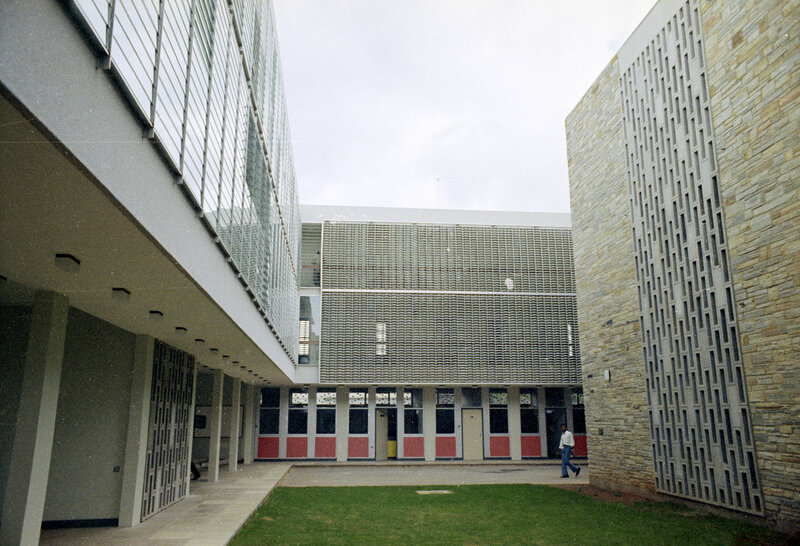 Work started on site in December 1969 and was completed in November 1971. The building was a three-storey rectangle around an open courtyard, with aluminium sunscreens and glass-reinforced plastic spandrels. It was always an unprepossessing building which required a good deal of attention, but it remains in use as the offices.